What Do I Tell the Owner About Those Ghost VCT Lines? Lightning Strike Roller Screed from Lura Enterprises Inc.
Here’s another great idea made possible by decorative concrete: a lounge chair that suns itself. This sleek S-curve, cast by Nick Relampagos using glass-fiber reinforced concrete, is embedded with radiant heating. Just turn it on and it gently warms you from beneath as the sun shines down from above. Like other fine finished GFRC pieces, the chair offers a surface that is smooth and pleasant to touch. Unlike some GFRC furniture, it’s not cold well after the sun comes up. If the chair looks familiar, you might be one of the hundreds who relaxed on it at either this year’s World of Concrete or Concrete Decor Show and Decorative Concrete Spring Training. Relampagos, who owns It’s Concrete!, based in Hayward, Calif., enjoys a close working relationship with Buddy Rhodes, which led to his exhibiting his chair at the Buddy Rhodes Concrete Products booth during both shows. Let’s let Relampagos tell his story: “While we were talking about upcoming shows, Buddy asked if I had any new designs that were coming up and asked if I wanted to display it. I always had envisioned my own designed lounge chair and told him about it. 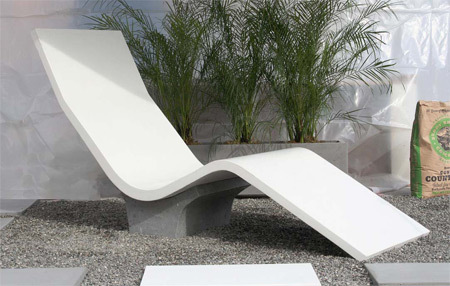 “There were already a few concrete lounge chair designs out, but most of them sit on the ground. I wanted mine elevated so I created the base for it. My second idea was that I wanted it heated, so I added the radiant heat. The elevated base was a perfect location for the heater controller. “The most important issue was the overall design and fit. I concentrated on angles that were tight rather than curvy — it had to look good as well as fit good. I took measurements of different-sized people sitting on a seat jig that I made and came up with an average on seat, back, thigh and overall length. Next were the angles of the chair — for this I went to my favorite lounge chair and baselined those angles for this lounge chair. More good fortune was in store for Relampagos. 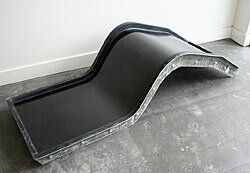 Buddy Rhodes Concrete Products now sells his fiberglass chair mold. The company has already shipped molds to Canada and Europe. Another potential customer hopes to cast 50 of the lounge chairs for a resort in Mexico. The acceptance of glass-fiber reinforced concrete (GFRC) has inspired a current trend toward light, thin and delicate concrete furniture. To illustrate what GFRC can do in furniture form, Jeffrey Girard of The Concrete Countertop Institute describes three projects — a table, a lounge chair and an S chair — that show off the strengths of the material. You can bet your boots that it wasn’t easy to overlay the three glittering, aggregate-spiked ramps that lead down from the VIP lounge to the dance floor in the nightclub of the Wild Horse Pass Casino.